Thank you to those people who took time out to help unload. Needless to say, it didn’t take long to organize time to try out the boat resulting in, few days later, and a full boat on the water. The boat is paid for in full due, in large part to the Fathers Day raffle which raised the mammoth amount of almost $4000. The raffle was drawn on 3September at the Ophir Tavern during an afternoon of games and barbeque. The winner of the barrow load of prizes was delighted and has her Christmas Shopping completed! Our very own Sophie Kastrounis won 2nd prize. To the business houses and individuals who donated prizes, especially the Ophir Tavern, to all who sold tickets thank you, fantastic effort but most of all THANK YOU Bev and Gail – without you it just would not have happened.Lets not forget the trivia night held over 3 years ago andthe $1000 donation from Orange’s Breast Cancer Support Group which kick started the boat fund raising. Thank you Mark Rutherford for coordinating the transfer of one leased boat to the DBNSW trailer and to the Carey family who interrupted Fathers Day activities to help Mark. Plans are in hand for the Dotting of the Eyes (waking the dragon from its slumber) and blessing ceremony to take place soon – more details later. More Good News – John Davis Motors are again meeting cost of the lease on the 2nd boat – that’s $1050. Support very much appreciated by all members, we really need two boats and having this cost covered allows Club funds to be put to other use. And the Next Major projectis already under way – in the capable hands of Mark Rutherford, Rex Keniry andPhil Lambert. A boat trailer – road registered. This will be enable us to extend our training year, when local temperatures plummet, by heading west, visit other clubs, or to rivers where we can do some training for The Ord Marathon – though Phil has something in mind out Mudgee way. Dragons Abreast Orange– Pearl and George attended the inaugural National Dragons Abreast Regatta at Kawana Waters, Qld. All we can say – it was an experience! Water events on the Friday were cancelled after about 30 marquees were blown away- all at same time! Saturday’s weather had most paddlers quietly hoping organizers would cancel proceedings. However, by end of the day – we were glad they didn’t. Race times were record breaking – with very strong tail winds. It was getting to the start line that was challenging. By mid morning, the men were called in to sweep as the women were really struggling to handle the boats in those winds. By that time, my team certainly didn’t want cancellations; we were on our way to the finals! George’s supporters team were on a roll too coming 3rd in the finals. Other activities included workshops, including an excellent “Coach the Coach” session, presented by coach of Brisbane River Dragons, a Club considered a force to be reckoned with. Their DA crew took out major finals, their Supporters crew “The Pink Connection” had all their competitors wallowing in their wake. The Dinner Saturday night was something George won’t forget in a hurry – I say no more!! DAA National Paddle Day – Sunday 02nd Oct, highlighting the benefits of dragon boating. 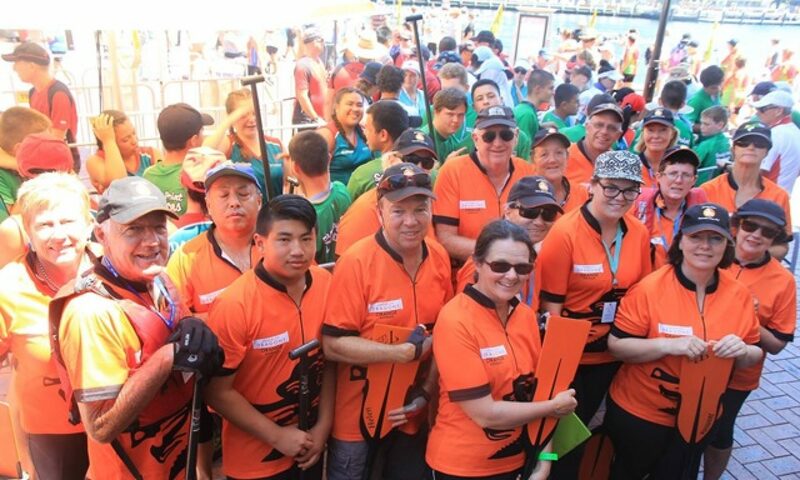 With help from the Club, DA Orange will not only be paddling but treating it as a Come and Try Day and an opportunity to publicly thank those individuals and business houses who have helped both Colour City Dragons and DA Orange. State MP Andrew Gee will be there, we’re expecting other community leaders too. Starting with paddling at 10am, followed by sausage sizzle at 12.30. DAA Regatta– 30th October Darling Harbour 6 members will be in a DA boat, George and Bev will be in a supporter’s crew. Fabulous Family Fitness team (winners at Orange regatta last Nov) for the Community teams category will be there. Thanks to Gail, Electrolux have donated a 520li fridge to the team as a major raffle prize so if you’d like to support DAA and the Fab Family Fitness team see Gail. There is fierce competition between the teams, not just to win races but to raise the most funds; a team raising in excess of $8000 is not unusual. Kamini Jain paddling camp–Slight change of dates- its now Oct Monday 17th to 19th – at Burrendong Sport and Rec Camp-Cost $325–includes accommodation and training. There are still a few places if you want to participate – highly recommended for those wanting to develop an efficient stroke. Training – Saturday’s 7.15am and from Tuesday 04th Oct evening training resumes 5.45pm. As last year, the Thursday evenings will be for the more serious paddler. Development Squad – Thirty six paddlers signed up and between 22 and 30 from 4 Western Region Clubs attend sessions. An hour and ¼ solid on water training, the only rests being to swap sides, has deterred few. We are moving up the pace a little now. Selection begins soon of the Coaches and Team Managers, who will take the teams up to State and National levels. In Aug “Tiny” Makin, a friend of Gail’s passed away, it was Tiny’s wish that donations be made to Colour City Dragon Boat Club in lieu of flowers, as a result of that request; $870 was added to the Club’s funds. A sub committee is considering how these funds can best be used in memory of “Tiny” and benefit the Club. If anyone has some thoughts on this please contact Gail or me ASAP. Chinese New Year Regatta– lock in the dates February 4th and 5th 2012 – if you plan to stay at GoldsboroughMort don’t forget, to get group rates, book under the umbrella of CCDB Club – otherwise you’ll be paying full rates, ask around there’s usually someone looking to share an apartment. Ord River Marathon– June 10th 2012. Details to be confirmed but I’ve been advised cost of the Marathon will be in range of $250 and $300 per person, this includes dinner the Sat night, all meals Sunday, transfer to and from Kunnanurra to Agryle Dam, celebratory drinks at end of journey, dinner Sunday night anda T shirt. Fourteen paddlers to a boat plus sweep, support/pickup boats travel with the d/boats carrying the gear. I think non-paddlers need to make alternative travel arrangements; there is a local tour company that fills this role. Schools/Community– James Sheahan and Anson Street school students will start dragon boating in October, andwe have couple of community groups wanting to try paddling – helpers will be needed. More details later. Membership – we’ll be processing next week – if you hope to attend regattas Oct 10th and Nov 13th you need to have paid your membership by Monday 26th. Let me know if you have problem ‘on line’ or have lost your user ID. If you transfer the $55 for Club component direct to Club’s bank, be sure to let Yvonne know. … time to be confirmed. we will be desperately short of helpers so give some thought to taking a long lunch or something to come out for ½ hour to lift the boat off trailer. Watch for urgent emails because when I have an ETA I will be sending out an SOS. Help will also be needed Sunday 4th September to load one of the leased boats onto the DBNSW trailer, this, I’m guessing will be about 3pm, but will confirm later. Squad training being in Dubbo that day means there will be shortage of helpers so let me know if you are available. Don’t forget – you pay only the $85 on line. Please contact me if you need help – if you really are unable to go online – bring your money to training this Sunday 28th – we’ll work something out – but only do this if you genuinely cannot, for whatever reason go online. Cash or cheques available for the Club component can also be paid Sunday – or deposited in CC Bank account – details sent earlier. Dobroyd 10s –- certainly lived up to its reputation – just so laid back. In one race we had five Clubs represented in our boat – not bad when a full crew was 10 paddlers, sweep and drummer. It was really good interaction between clubs, we got to know John (from Nowra,) a little better, most of you have seen John at regattas. He of the Goths – pink beard, chains and tatts fame. We’d have been stuck without him. Elise and Bella did great job as stroke makers, with yet another very experienced paddler commenting on the high standard of paddling our juniors have, but then we don’t need anyone to tell us how good they are do we? Sweeping – yours truly has got first 2 races out of the way. Dobroyd’s is good place to sweep, no lanes, plenty of space, short course. The negative is currents, tides and the wind. NEXT REGATTA is Ryde, September 11th. Need names in by 05th Sept, that’s week Monday – and you need your new ID tag by then. Bev Waters, Gail Wright, Wendy (Gail’s sister), Jan Richards, Regina Fogarty, Ella, Phil Lambert, Judy Carter, Jo Krats, Rhonda Sawtell, Jo Beeby, Brenda (Megan and Elise’s mother) and Sophie Kastrounis (Alex and Terry’s mother). Others who have taken books have been the business houses who contributed the prizes and the Ophir Tavern have been selling tickets in the bar. Then there are those who have been selling tickets at the City Centre last 2 weeks (and again tomorrow). Saturday 03rd tickets will be sold in morning only, at IGA Supermarket, if you can help there, contact Ella 6361 4050. If you haven’t bought your raffles tickets yet – see any of the above OR get a book for yourself from Gail 6362 4193 OR come along to the Ophir Tavern Saturday 03rd Sept from about 3.00pm, there will be games, sausage sizzle and of course tickets to buy before the big draw. Its quite likely someone is going to have to take the barrow of prizes to Sydney or even further afield as Brenda, never one to miss an opportunity, was selling tickets to paddlers at the Dobroyds. Don’t forget to return all books to Gail, Bev or Ella by Friday 02nd or bring along Saturday 03rd to the Ophir. Kamini Jain paddling camp – Oct Tuesday 18th to 20th – at Burrendong Sport and Rec Camp – arriving late afternoon/early evening on 18th, full day training – on water, reviewing video, discussions Wed and Thursday. Departing mid to late afternoon 20th. Cost $325 – includes accommodation and training. There are still places if you want to participate. Training for Colour City Dragons – This Sunday 1.00pm on the Lake – then as result of numerous requests, there has been an executive decision – training from Saturday September 10th training will be 7.30am. Tuesday and Thursday evening training will commence with daylight saving (almost make you wish for daylight saving to continue longer). Next general meeting Wednesday 8th Hotel Canobolas.